Arbitration: Procedure and Practice explains the procedure and processes involved in Arbitration and gives a detailed and step-by-step information and examples of Arbitration proceedings such as arbitration agreement, appointment of the arbitrator, filing of claim statement by the claimant and written statement by the respondent, points at issue, oral and written arguments, awards, and challenge against awards, appeals, or enforcement of awards. 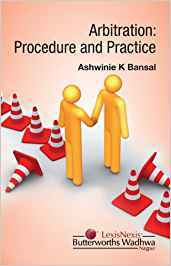 This book explains the arbitration process in simple and plain language for the benefit of every participant in the arbitration proceedings. The object of this book is to educate the participants on how to get a just and fair binding final award as the outcome of the proceedings because many awards are set aside due to minor avoidable mistakes by the participants. The book is a ready reckoner for many who want to be acquainted with the process of arbitration. Entire technology and know-how behind the process of arbitration has been enumerated with answers to the various questions mentioned in the book with a reference to the common errors, pitfalls, and tips mentioned at the end of every chapter. The book provides guidance to the students as well as legal professionals in understanding the procedure and practice of arbitration which will help them to comprehend the complicated arbitration procedure by following a comprehensive approach, with a comparative analysis of international law of the countries like Sri Lanka, Nepal, USA, UK.